I think if you keep the jeans as they are, I would like to see a heel with them? Love the silver sandals. I don't love bronze but I adore anything in silver... nice sandal. The shorts look great, really nice colour and the length works for me. JMO. 1) I would taper the white jeans; the shape appeals to me more. 2) The silver is fine, but I like the original bronze as well! 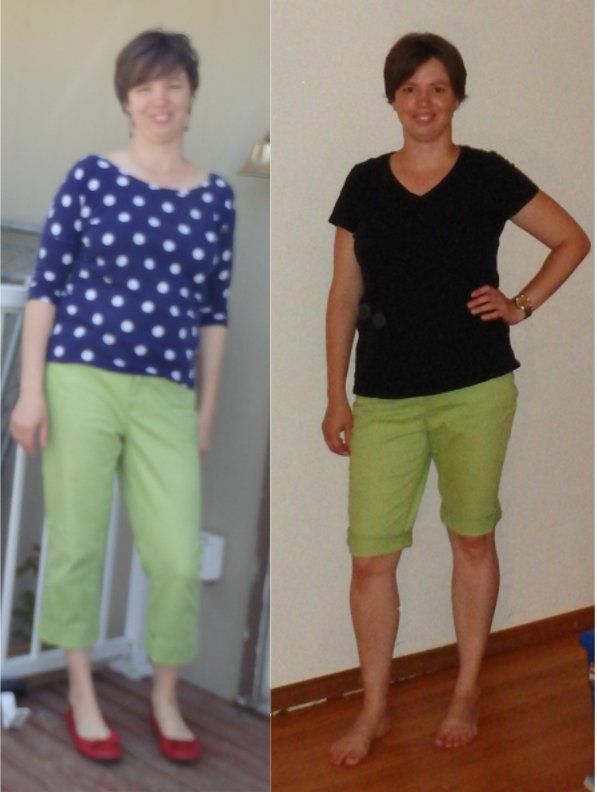 3) I would go shorter on the green capris; mid-thigh. 4) I like the over-the-knee length on the tomato-red crops. ETA: What Deborah said; if you keep them bootcut they would probably look nice with a heel. 1. Yay for white jeans! I have several white denim bottoms and they are always in rotation. I like the jeans both ways so am no help there. 2. Great job! They look fine. 3. I like both shorter lengths on you. Which feels right to you? 4. Love the bright red! I like both. If you don't have some hemmed like the last photo, I'd go with that...the longer length. You can still always roll it shorter when you want. The silver sandal looks to be a better color on you than the bronze. I like the green shorts how you have them now. The others I'm not sure. I think I like the white jeans as is, although you do rock skinnies! LOVE green shorts: They're modern and flattering. You did a great job with the shoe dyeing, but I think I prefer the bronze. I say this only so you'll always believe me when I tell you that you look fab, which you do, by the way, in silver or bronze! I liked your sandals bronze, but the silver is nice too! I like the jeans either way, but probably skinnier edges out just because of keeping hems cleaner. I think the green shorts look good, and I like the red just below the knee! Some great items here. 4 - just below the knee. Great colour! Thanks for the comments and suggestions all! 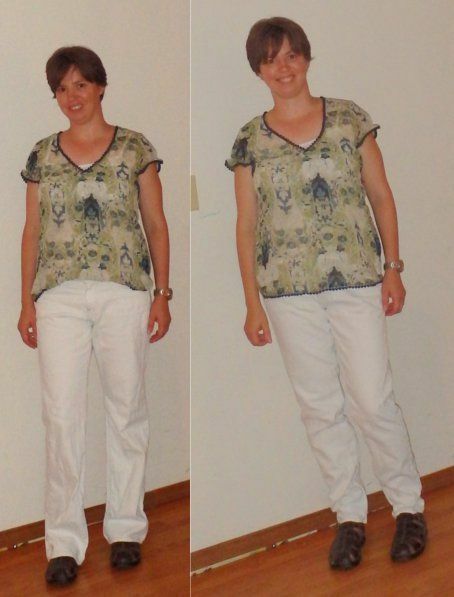 I'll probably taper the white jeans - I actually like them better boot-cut in the pics, but I don't think I can keep the hems clean. Thanks for the length suggestion on the reds - I think they'll become clams! #1. I like the jeans both ways, so do what works best for you. #2. I like your sandals both ways. Which shoe painting dye did you use? #3. LOVE the green shorts at the knee length. #4. I like the red pants just below the knee! Suz - I'm embarrassed to admit that this silver shoe paint is Rustoleum chrome spray paint. I'm intending to buy some shoe/leather paint from Dharma trading, but haven't gotten around to it yet. I'll report back with how the Rustoleum holds up as I start wearing them. Our humidity made them take a long time to dry. I love the silver sandals and the green shorts. 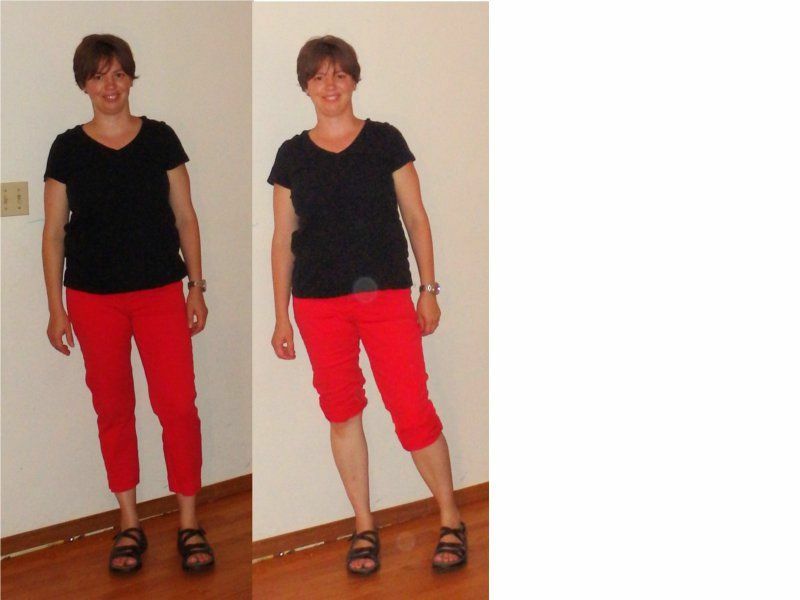 I'm not sure about the red capris - I have trouble with capri lengths too. The white jeans look good both ways. I did the same DIY though and really like my tapered white jeans. I didn't have a choice with mine since the bootcut white jeans were too short, which was the reason I decided to taper them.